RAK Properties has launched Phase Two of its Flamingo Villas project, while indicating that construction of the first phase of the coastal residential community is progressing as scheduled to enable the handover of units by the year-end. Part of the Mina Al Arab community in the UAE emirate of Ras Al Khaimah, Flamingo Villas is a much sought-after project placed amidst lush landscaping, protected coastal wetlands and natural pristine beaches. Demand for the first phase of the project was “exceptional” according to the Ras Al Khaimah-based developer, which expects even greater interest for the second phase that comprises 57 villas, of two to three bedrooms. Residents of Phase Two of Flamingo Villas will be able to enjoy a range of world-class amenities, right from a central park with a children’s play area which is connected to Phase One swimming pools and tennis courts. Moreover, residents can make the most of the top-notch facilities in the wider Mina Al Arab community. 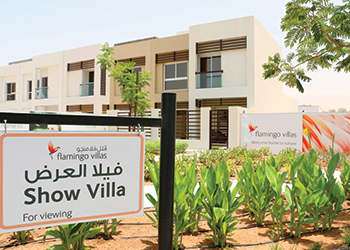 RAK Properties has also opened the Flamingo ‘show villas’ for public viewing. Diyar Al Muharraq has entirely sold out Phase One of its commercial villa plots, situated at a prime location within the Diyar Al Muharraq project located off the northern shores of Muharraq island in Bahrain. Plot sizes in this phase range from 785 to 887 sq m located in a specialised commercial strip allocated for non-residential use on the main road to the northwest of Diyar Homes and opposite the Diyar Town Centre. The plots are described as being ideal for businesses such as beauty salons, spas, offices, gyms, medical clinics and others requiring independent locations. The title deeds will be handed over to their owners, comprising Bahraini and GCC nationals, in Q3 2015. Al Shaer further says the infrastructural elements that will support the plots are set to be completed by 2017. He adds with the successful completion of this sale, Diyar Al Muharraq now looks towards the launch and sale of Phase Two commercial villa plots, which are expected to be equally popular and sought after. The second phase will be located on the main road to the south of Diyar Homes Phase Two and will encompass 18 plots. Dubai-based Indigo Properties has announced the completion and delivery of units in Indigo Spectrum One, a prestigious residential development located in the Commercial Business District of International City in the UAE emirate. Strategically located and well connected to all the main arterial routes such as Dubai-Hatta Road, Emirates Road and Academic Road, Indigo Spectrum One is a seven-storey building including two basement levels and a ground floor that offers comfort, luxury and modern amenities in each of its 96 apartments, says the developer. The 166,000-sq-ft-development has a contemporary and tasteful design, featuring one- to three-bedroom apartments, a rooftop pool, gymnasium and sauna. The building has two basement parking areas. In addition, the ground floor has been well planned to include retail outlets, each with bathroom and pantry facilities. The units are competitively priced. The building, which sold out off-plan, has apartments ranging from 816 sq ft to 2,900 sq ft, with prices starting at Dh725 ($197) per sq ft for apartments and Dh950 ($258) per sq ft for shops, the statement added. Factors such as an intelligent design, high quality construction material, elegant interiors, retail units on the ground floor and ample parking space make this a prime property for investors and end users, says Maitra.